Los Parques Científicos Tecnológicos (PCTs), o Parques Tecnológicos (PTs), se han estudiado principalmente en los países desarrollados. Respondiendo a esta brecha de conocimiento, en este artículo presentamos una caracterización del proceso de desarrollo de las iniciativas de PTs en Colombia por medio de un estudio de caso múltiple sobre las iniciativas reconocidas por la política nacional de PTs y del análisis comparativo del desarrollo de las mismas, a la luz de cinco modelos identificados en la literatura de parques. Típicamente, a un PT debe tomarle en promedio diez años alcanzar su tercera fase de desarrollo o fase de madurez. En Colombia, el desarrollo de los PTs no presenta un comportamiento típico dado que después de doce años del impulso brindado por el Estado Colombiano a estos proyectos, con la promulgación de la Política Nacional de PTs, tres parques se mantienen en fase de incubación como proyectos; la institución líder hasta el 2012, el Parque Tecnológico de Antioquia anunció el inicio de su liquidación; y el Parque Tecnológico de Guatiguará aunque avanza en su proceso desarrollo, se mantiene en fase de incubación. Los resultados de investigación incluyen la identificación de variables diferenciadoras dentro del desarrollo de las dos iniciativas de PT más desarrolladas en Colombia y un análisis de perspectivas de futuros campos de investigación. PALABRAS CLAVES: Parques Científico-Tecnológicos, Parques Tecnológicos, modelo de desarrollo, fase de desarrollo, desempeño. Science Technology Parks (STP), or Technology Parks (TPs), have been studied mainly in developed countries contexts. Responding to this knowledge gap, this article presents a characterization of TPs initiatives development process in Colombia through a multiple case study of parks recognized by the TPs national policy, and a comparative analysis development of them, from the point of view of five models identified in TPs literature. Typically, a TP must take on average, ten years to reach its third phase of development or maturity phase. In Colombia, the development of TPs, there are not the typical behavior because after twelve years of support provided by the Colombian state for these projects, with the enactment of TPs National Policy, three parks keep in incubation stage, as projects; the leading institution until 2012, Antioquia Technology Park announced its liquidation; and Guatiguará Technology Park although of advances in its development process, keeps in the incubation stage. Research results include identification of differentiating variables in the development of the two most developed TPs initiatives in Colombia and one analysis of future prospects of research fields. KEYWORDS: Science Technology Parks, stage development, development model, performance. Forma de citar: Angulo Cuentas, G., Camacho Pico, J., & Romero Riaño, E. (2014). Análisis del desarrollo de los parques científi co-tecnológicos (PCTS) en Colombia. En R, Llamosa Villalba (Ed.). 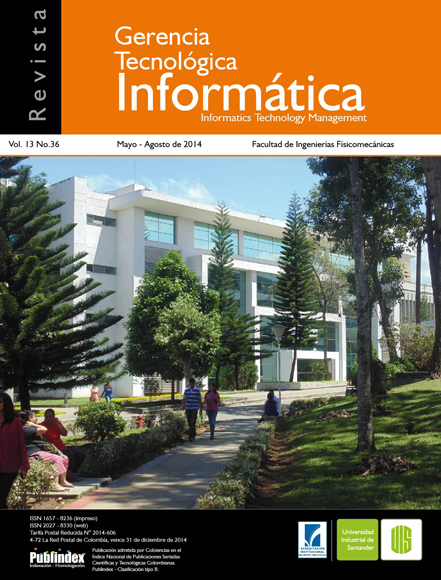 Revista Gerencia Tecnológica Informática, 13(36), 49-59. ISSN 1657-8236. Acosta, J. (2009). Ciudades de América en la sociedad del conocimiento. Bogotá: COLCIENCIAS. Allen, J. (2007). Third generation science parks. Manchester: Manchester Science Park Limited. Annerstedt, J. (2006). International Handbook on Industrial Policy. Science Parks and High-Tech clustering. Northampton: Edward Elgar Publishing. Bakouros, Y., Mardas, D., &. Varsakelis, N. (2002). Science Park, a high tech fantasy? An analysis of the science parks of Greece. Technovation, 22,123-128. Bergek, A., & Norrman, C. (2008). Incubator best practice: A framework. Technovation, 28, 20–28. Camacho, J., Romero, E., & Angulo, G. (2013). Colombian First Generation Technology Parks: Aproach for identifying lessons learned. (Ed.). World Academy of Science, Engineering and Technology del 14 al 15 de Abril de 2013. (p.149- 153) Venecia, Italia.ISSN:2010-3778. Castells, M., & Hall, P. (1994). Technopoles of the world: the making of twenty-first-century industrial complexes. UK: Routledge. Chan, K., Oerlemans, L., & Pretorius, M. (2009). Explaining Mixed Results on Science Parks Performance: Bright and Dark Sides of the effects of inter-organisational knowledge transfer relationships. South African Journal of Industrial Engineering, 20, 53-67. Colombia. (2003). Política de Parques Tecnológicos. Bogotá DC: Ministerio de Desarrollo. Colombo, M., & Delmastro, M. (2002). How effective are technology incubators? Evidence from Italy. Research Policy, 31, 1103–1122. Cote, C., Navarro, L., & Viana, R. (2012). Articulación universidad – empresa en Colombia: una evaluación cualitativa de los centros de desarrollo tecnológico ubicados en el parque tecnológico Guatiguará del departamento de Santander – Colombia–. Recuperado (2013, Septiembre 19) de http://es.scribd.com/doc/65557771/ArticulacionUniversidad-Empresa-en-Colombia. Deong- Sung, O., & Gi-Don, A. (2012). Three stages of science park development: The case of Daedeok Innopolis Foundation, Asian Core Program. Recuperado (2013, Septiembre 5) de http:// dl.ueb.edu.vn/bitstream/1247/4296/1/11.%20 Oh%20Deong%20Sung.pdf. Detwiler, P., Lindelöf, P., & Löfsten, H. (2006). Utility of location: A comparative survey between small new technology-based firms located on and off Science Parks—Implications for facilities and management, Technovation, 26, 506–517. Drawoska, J. (2011). Measuring the success of science parks: performance, monitoring and evaluation. Recuperado en (2013, Septiembre 10) de http://www.iasp2011cph.com/upload/ 171/ Monday/1%20%20Justyna%20Dabrowska.pdf. Felsenstein, D. (1994). University-related science parks—‘seedbeds’ or ‘enclaves’ of innovation?. Technovation, 14, 93-110. Fukugawa, N. (2006). Science parks in Japan and their value-added contributions to new technologybased firms. International Journal of Industrial Organization, 24, 381–400. Kihlgren, A. (2003). Promotion of innovation activity in Russia through the creation of science parks: the case of St. Petersburg (1992–1998). Technovation, 23, 65–76. Lindelöf, P., & Löfsten, H. (2003). Science Park Location and New Technology-Based Firms in Sweden – Implications for Strategy and Performance. Small Business Economics, 20, 245– 258. Lindelöf, P., & Löfsten, H. (2002). Growth, management and financing of new technologybased firms: assessing value-added contributions of firms located on and off Science Parks. Omega, 30, 143–154. Löfsten, H., & Lindelöf P. (2002). Science parks and the growth of new technology based firmsacademic industry links, innovation and markets. Research Policy, 31, 859-876. Löfsten, H., & Lindelöf, P. (2003). Determinants for an entrepreneurial milieu: science parks and business policy in growing firms. Technovation, 23, 51-64. Luger, M., & Goldstein, H. (1991). Technology in the garden. Research parks and regional economic development. North Carolina: University Press. Hu, M-C. (2011). Evolution of knowledge creation and diffusion: the revisit of Taiwan’s Hsinchu Science Park. Scientometrics, 88, 949–977. Morales, M., Plata, P., & Casallas, C. (2011). Los parques tecnológicos en Colombia como mecanismo de vinculación universidad-entorno. Libre empresa, 15, 11-29. Phan, P., Siegel, D., & Wright, M. (2005). Science parks and incubators: observations, synthesis and future research. Journal of Business Venturing, 20, 165–182. Radosevick, S., & Myrzakhmeth, M. (2009). Science and Technolgy Parks in Rusia. Technovation, 24, 645-656. Ratinho, T., & Henriques, E. (2010).The role of science parks and business incubators in converging countries: Evidence from Portugal, Technovation, 30, 278–290. Rodríguez, A. (2012). Los parques científicos y tecnológicos en América Latina: Un análisis de la situación actual. Recuperado (2013, Agosto 5) de http://www.iadb.org/intal/intalcdi/PE/ 2013/12571.pdf. Sofouli, E., & Vonortas, N. (2007). S&T Parks and business incubators in middle sized countries: the case of Greace. The Journal of Technology Transfer, 32, 525-544. The United Kingdom Science Park Asociation, Evaluation of the past & future. Economic contribution of the UK Science Park Movement. Recuperado (2013, Septiembre 5) de http://www. ukspa.org.uk/ContentFiles/ UKSPAEvaluationExecutiveSummary.pdf. Yin, R. (1994) Discovering the Future of the Case Study: Method in Evaluation Research. American Journal of Evaluation, 15, 283–290.